Bram Stoker was to turn 60 later that year, and ten years had passed since he wrote the novel about Count Dracula. The royalties from its sale were small, the reading audience hadn’t yet seen the book’s greatness. He had for many years been working as a business manager of the Lyceum Theatre in London and as a manager for Henry Irving, the famous actor. Or in Stoker’s words, ‘the finest actor who ever trod the boards’. But when Irving died in 1905 life became harder for Stoker and his health rapidly got worse. He had three strokes and it was with a declined eyesight that he saw the landscape when he in June 1907 travelled through the area in Surrey that was called ‘Little Switzerland’ for its clean air and spectacular hills. Bram Stoker had earlier in life worked as a journalist and now he had returned to this profession, writing for The Daily Telegraph and New York World. For the latter he wrote a series of profiles of up and coming celebrities and politicians, including Winston Churchill. And now he was to make an interview with one of Great Britain’s most famous authors, a man that Stoker got to know already in the early 1890’s when he put up a play written by the author – Sir Arthur Conan Doyle. In the summer of 1893 Arthur Conan Doyle and his wife Louise (Touie) were on a trip to Switzerland. Conan Doyle gave a couple of lectures on different subjects, and one day they visited the Reichenbach Falls near the village Meiringen. The perfect place for the death of Sherlock Holmes, Conan Doyle thought, and wrote the short story ‘The Final Problem’, which was published only four months later. But when they got back to England the thought of death was brought to them also in another, more terrible way. Louise was diagnosed as suffering from tuberculosis and not expected to live longer than a few months. Conan Doyle wrote to his mother about almost everything. In the letter above he also discusses all the building details of the house and comments the views she evidently had expressed in a previous letter. He ends the letter with hoping that the house will be ready for habitation by May or June 1896. Conan Doyle believed at this point that the total cost of Undershaw would be about £6,000, and he hoped that the value would grow to £10,000 in a few years. But there were additional costs and he told his mother that he had to write some short stories to raise the wind. His novel ‘The Tragedy of Korosko’ was to be published soon and that would also give him the money that he needed. It’s interesting to note how many of his stories, especially the later Sherlock Holmes stories, that were written to pay for house renovations and similar things. 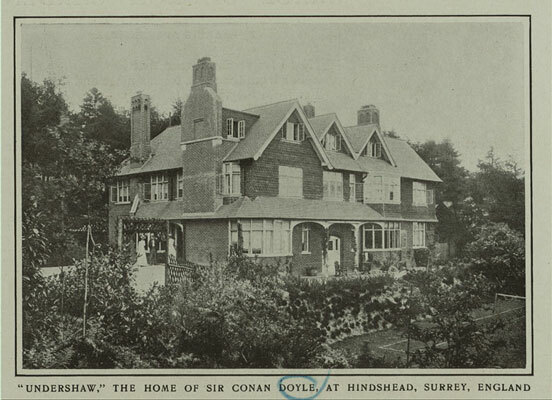 We should probably be thankful that Conan Doyle chose to build and live in such big and expensive houses as Undershaw and, later in his life, Windlesham. During the years at Undershaw he wrote The Hound of the Baskervilles, The Return of Sherlock Holmes, The Great Boer War, Sir Nigel and a long list of short stories and other writings. On July 4, 1906, Louise died aged 49 at Undershaw, from the effects of tuberculosis. She was the reason why Conan Doyle had built Undershaw, this astonishing house that was the home of the author during one of the most interesting periods of his literary life. So when Bram Stoker visited Undershaw, the main reason for the house, Louise Conan Doyle, was no longer there. The wedding was held on September 18 and Bram Stoker was one of the 250 guests. The couple wanted a fresh start and they left Undershaw. Conan Doyle bought the house Windlesham, near Jean’s parents in the Sussex town of Crowborough. Undershaw was leased to the retiring headmaster of Uppingham School, Edward Carus Selwyn. He died in 1918, and in 1920 Conan Doyle decided to sell Undershaw. 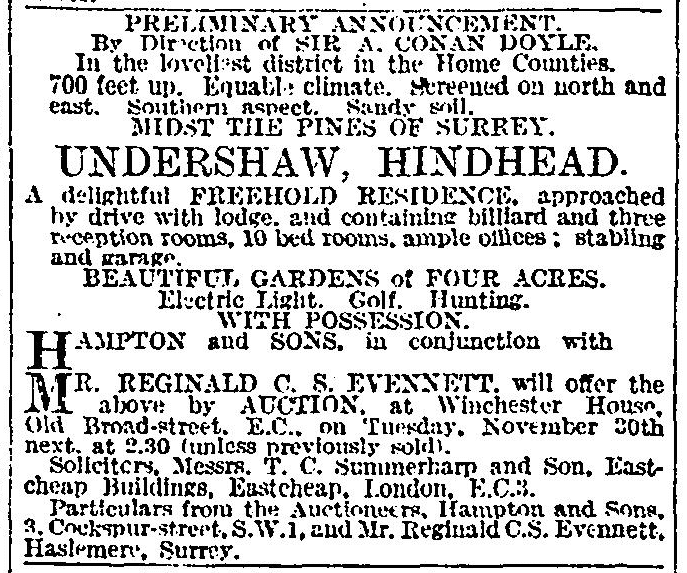 On October 2, 1920 Undershaw was one of the properties for sale in The Times (see picture below). But the house was evidently not easy to sell. In The Times of May 10, 1921 it is mentioned that ‘to ensure an immediate sale a very low price would be accepted’. A would-be hotelier bid £4,000 and the house was sold. It remained hotel and restaurant until 2004, and since then the protests have grown against a developer who wants permission to divide Undershaw into three separate dwellings. The Undershaw Preservation Trust is working hard to keep Undershaw as a single property. Visit their web site and help us all save Undershaw! As you can read on their web site the matter is urgent. SherlockHolmes.se is the Swedish site about Sherlock Holmes and his world, and the content is usually in Swedish – but I (Mattias Boström) hope to publish more in English in the future. At the moment I’m writing a non-fiction book about the 125 years long success story of Sherlock Holmes. 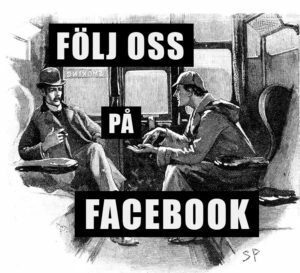 The book – ‘Från Holmes till Sherlock’ (in English: ‘From Holmes to Sherlock’) will be published in Swedish in 2013. Hopefully it will be translated into English, too. This is one of the most intelligent, well spoken and powerfully researched blog posts I have seen in years. By far one of the top five pieces of information that I never ever knew. What an amazing back story, I am happy it was told by someone that is as descriptive and colorful as Doyle always was. Bravo to you.